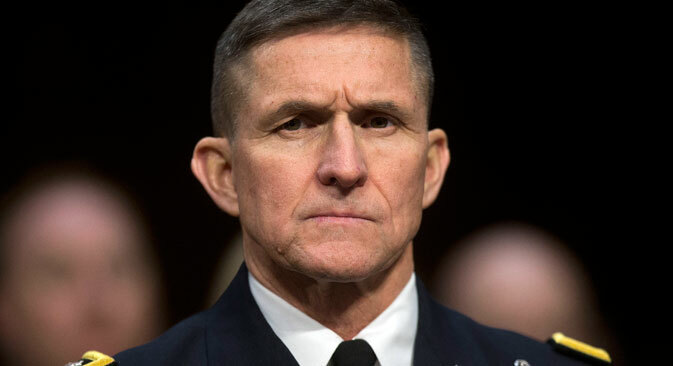 Michael Flynn, the director of the Defense Intelligence Agency, a U.S. intelligence service focusing on defense and military matters, visited Moscow in December 2015. Flynn, who headed the service from 2012-2014, is known for being a critic of the U.S. invasion of Iraq and the international military operation in Libya. He discussed the consequences of the Russian intervention in the Syrian conflict with the business magazine Vlast. According to an Al Jazeera report, you were the first senior U.S. official to state publicly that the United States, Turkey and Saudi Arabia are helping Al Qaeda-related groups inside Syria with weapons to overthrow Bashar al-Assad. Is that what you said? No, that's definitely not what I said. I meant that we support such diverse anti-Assad forces in Syria, such diverse groups, that it is almost impossible to figure out who is who and who is working with whom. The increasing complexity of the composition of the warring Syrian opposition made it extremely difficult to identify. That's why I'm sure that now in terms of U.S. interests we must once again take a step back and revise our strategy, because there exists a relative probability that we will support, along with other anti-Assad forces in Syria, forces linked to the Islamic State. We can't operate under a principle of serving both sides. We must very clearly define what we are trying to achieve and who we intend to work with. You said that the U.S. government turned a blind eye in 2012 to a report of the Defense Intelligence Agency, which you headed then, about the substantial progress of radical Sunni Salafi groups within the Syrian opposition. Why did this happen? This was intentional and was done for political reasons. The problem was that the intelligence was accurate, the Intelligence Agency informed the authorities about the real situation. And this, in my opinion, is the main function of intelligence – to speak truth to power. If I tell the president the truth, but he does not like what he hears, this is not my problem. My task is to provide an adequate report. That report discussed, among other things, the significant deterioration of the situation in the region. In 2013 there were 300 bomb attacks on the territory of Iraq. The situation was getting worse. The decision to withdraw from Iraq eventually became one of the preconditions for the emergence of the Islamic State. One of the reasons why the United States was reluctant to supply weapons to the Syrian opposition for a long time was that there was no guarantee that it would not fall into the hands of radicals. Since then the situation has only worsened. Why did the U.S. still decide to supply arms in 2013? I do not know what played a decisive role. I know one thing – we need to stop investing in this conflict. By supplying weapons to Syria, we incite the conflict. It concerns Russia, too. We need to invest in security and a great role in this should be also played by the community of Arab countries. What are the possible consequences of the Russian intervention in the conflict? From this point of view, the Russian intervention in the form in which it occurred immediately changed the balance and dynamics that had existed before. I'd really like to talk about it with President Putin. After all, what are the consequences and what outcome has he already achieved? We have seen the incident with the Russian warplane downed by Turkey and also an explosion onboard an aircraft with Russian passengers blown up by the Islamic State, as a result of which many people died. These consequences are too disadvantageous for the start of an intervention. Both are undesirable, but these are real consequences. President Putin's decision to intervene in the conflict and to do what he is doing there, in my view is connected to problems within Russia. Five or 10 thousand Russian citizens are fighting in Syria, which is partly why Russia wants to be there – so that these people do not return to Chechnya, Dagestan, Uzbekistan and Moscow. I think that we did not recognize and did not realize this – that President Putin is trying to solve a problem that really exists and that part of its solution lies in Syria and Iraq. The main problem is how we – I mean the great powers, Russia and the West – can work together. This is a great question. And this is not about diplomatic negotiations, this is about how we will work on the battlefield, on the information field and on the digital battlefield, which is also quite real. We firmly believe in the existence of a mutual interest in destroying the cancer of radical forms of Islam. If we don't do this together, we will have to try to do it alone, which will be much more difficult. As a young officer, I learned the rule that the best plan is the one that leaves you with more alternatives at the very last moment. I wonder whether President Putin believes that he has the best plan? Does President Obama believe the same? When I look at what's going on, how events develop, I can see a huge threat hanging over us. I think we did not reserve enough choices for ourselves. And the direction of where we are going now, this widening of the conflict, is a big war. The closer we are to it, the higher the risk, the higher the price, the less choice that we have. That's why it is important now for us to work together, the United States and Russia, to determine whether we can develop more opportunities to stabilize the situation. Does the U.S. have a long-term strategy for Syria and the region as a whole? Here, I can only give my own view on this issue. Because I really do not understand what the U.S. strategy is today; it lacks clarity, precision and it lacks consistency. In my view, the strategy should consist of four components: first you need to achieve security, then you have to stabilize the region, then you have to begin stimulating economic prosperity in the region and bring in new ideas, new technologies and a new education system. The region has to develop for a sufficiently long period of time. So that it can become a reality, this strategy must be implemented not only by the U.S. and the West: it should also involve regional powers – Russia, China and India. This is because the current situation affects all of us without exception. In the short term we cannot keep going in the same direction that we are headed. This is unsustainable. First published in Russian in Kommersant-Vlast.